A few days ago we all watched a video - that became viral online in hours - with a very young girl violently pushed on the ground and handcuffed by a policeman while screaming for her mother. The girl was obviously very young and the whole scene was heart-breaking. The violence the policeman had used was inexcusable and this act unfortunately was not the end of the video. In the next few scenes that remained, the same policeman pulled his pistol, threatening a group of teenagers who obviously had run to help their friend and moved against them hitting and pushing. Later the same day we all found out in shock that the girl was just 14 years-old and she was part of a group of teenagers - average age 15 - who were partying in a community swimming pool and had been victims of racist abuse. 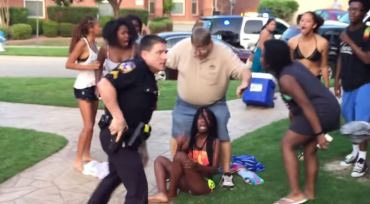 The group of kids were African-Americans and this made you see the whole incident in a new perspective. While the whole act was inhuman, excessive violence against a minor was used plus abuse of power from a policeman who endangered lives with pulling his pistol, the fact that everything was a result of racist profiling, made everything much worst. Sadly, I always thought that exercising violence against a minor and especially when it is the policeman who exercises violence is the worst thing ever, now we found out that there is even worst. Things in Europe are not well the last few years, increase of racism, Islamophobia, prejudice and discrimination. There are actual European states, members of the European Union that have governments that include racist, xenophobic and prejudice elements, like the Finnish government. But we fight them and at least there are still strong barriers in the society and the political system that keep them in the corner. I’m not in denial, of course there is racism in the European police - like there is in all the society - but the same time I could never imagine pictures like the one I saw - with this 14 years-old girl - happening in London, in Berlin, Rome, Athens or Helsinki. This kind of behaviour, which is not just racist or xenophobic but it is more likely a hate behaviour even though it exists, the European society, the European political spectrum and the European states keeps it in the corner, – in the backsides of the society - waiting for the ones who practice it to do the first mistake and then lead them to prison. And both sides know that. Now looking at the other side of the Atlantic I have the feeling that things have evaluated in a totally different way. Hate rhetoric and actions have entered mainstream society and politics. Sometimes I read things US politicians say, policemen do, media repeat and I feel shocked. In a country that has so strongly legislate equality among genders, religions and races - so strongly that it actually becomes an example globally - the fact that all these rights are violated constantly even from the ones obliged to guard those legislations, is shocking. This is not only about the 14 year-old girl, this is about incidents that happened so often that you start thinking that it might be some kind of conspiracy. A country that actually lived a civil war for equality, 150 years ago and had perhaps the biggest and strongest civil rights movement on earth, in 2015 looks like it is just in the beginning. Amazingly US police, the people sworn to serve the constitution that protects equality and protect the people without prejudice, are the front window of this escalating change in the US society. 1,149 people of all ethnic groups were killed by the US police in 2014. Most unarmed and innocent of any crime. Michael Brown, Eric Garner, Walter Scott, and Freddie Gray are just few names that come to mind and this is because their murder was the reasoning for riots and demostrations all around USA. And the authorities might have managed to end the riots but the fires are still there, everywhere, waiting for the next victim that they are sure that it will come. The scary thing is that while all that escalates, nobody seems to take a serious action against it. On the contrary what I see is more politicians running in support for the ones who have exercise acts of hate and more "excuses" published in the media. You read some of the things candidates for the US presidency say and you start praying that these people will never be elected to anything further to their toilets-cleaning responsibilities. These people divide the nation they are supposed to unite. And unfortunately most of them are not their house’s toilet-cleaning responsible but they have powers, powers to legislate for the nation. In Europe, people like Ted Cruz or Rand Paul would be compared to Timo Soini, Nigel Farage or Marianne Le Pen and aknowledged as enemies of democracy and the state. Jeb Bush would look like something between Sarkozy and Berlusconi, a bad joke but no joke. In USA these people are seriously hopeful for the presidency. But let’s return to the 14 years-old. If these kids have racially screened and profiled in their 14 then what happens in the school, in the university, in the society? It make you wonder if Barack Obama himself was an exception and why? Was he raised and grewup - even politically - in a perfectly protective environment which allowed him (perhaps destine him) to become US president or did he live in a glimpse of time where equality really worked and now it is all over? What would have happened to a teenage Obama today and what happens to the teenage Obamas today? Truth is that the attacks barack Obama and his family receiving, are unthinkable for any leader anywhere in the world. Sometimes I think even people like Mugabe or Putin hearing less. Nobody has dared - at least not yet - to accuse Putin that he is an alien. Obama has heard that. On top of that there even scarier messages coming from the other side of the Atlantic. Free carrying a weapon? I’m sorry but this is unthinkable. In UK there was a talk a few years ago if the policemen should carry a weapon and the decision was unanimously against. In USA they are talking about ordinary people going around carrying rifles and pistols? Like Hollywood? Like old Wild West? What wild west? Because in real life the Wild West was more like the little house in the prairie and definitely not like Clint Eastwood in El Paso. Imagine if there have been 1,149 murders only from the police, how many will be when everybody is carrying a gun and every single bickering will be solved with bullet holes. A country where a religion liberty law (why do they always find these pompous names?) can discriminate people. A law. An official law. And a lot of people find that normal. Please don’t argue mentioning Caitlyn Jenner's case. This is not the best example of equality. When you are a millionaire, with a famous background to protect you and the media to support you, everything is possible, even to change gender. But what happens in the real world, where the person is not a Kardashian (even indirectly) and doesn’t have a popular live show with millions of fans to make like in the Facebook? I was reading the other day about a boy in USA who decided to leave his hair long so after two years he could donate them to an organization that supports kids with cancer and during the therapies they lose their hair. The boy didn’t change gender, he just let his hair really long. It’s amazing the kind of abuse he met within those two years. Everywhere, from school to his own neighbourhood. Perhaps this is not the right time to open this conversation, but the issue remains. What has happened with equality in USA? And is the racial screening that has led to so many deaths just the peak of the iceberg for a society that lives and grows with hate? Is USA of 2015, a country that needs the rebirth of the civil rights movement and perhaps its necessity now is even stronger than it was fifty years ago? And where that ends? Or is it just the beginning of a state and a society that apart of embracing hate it also embraces tyranny and aggressiveness against anybody despite colour, religion and gender who is not American? Indeed, perhaps a new civil rights movement is needed. To add insult to injury, a fourth grade teacher, Karen Fitzgibbons, wrote a racist rant on Facebook defending the actions of the police officer Eric Casebolt and then challenging anybody who dared contradict her. She got her wish and got fired from her job within a day. The above is true, but in the interest of the whole picture of this sorry event, perhaps it bears mentioning too that officer Casebolt also lost his job together with a public reprimand from the police commissioner of Mc Kenney, Texas.